An easy and really tasty, version of the Chinese short soup. The dumplings can be made ahead and kept covered in the fridge or frozen to use later. Process the chicken, bread & kecap manis, until minced. Add the mushrooms & spring onion, stir to combine. Place one tsp of chicken mixture on each wonton wrapper, dampen edges with water, bring the sides together and twist the top to seal. Prepare the chicken noodle soup as directed on the package. Bring to the boil and turn down to a simmer. Add the vegetables and noodles, bring back to the boil and simmer 5 minutes. Divide the soup between 4 bowls, add dumplings and sprinkle with finely sliced spring onion to serve. Notes... 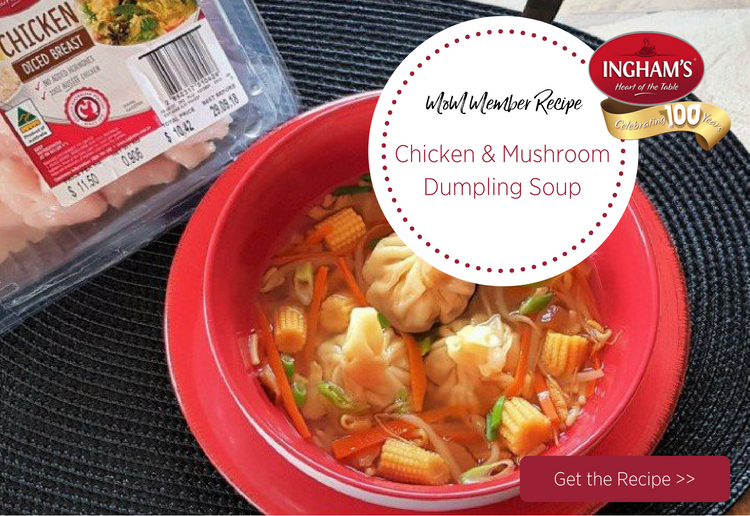 This recipe is a great standby meal, the dumplings can be frozen and added to the soup to heat through, just simmer a little longer, so easy and quicker than take away ! This looks so fresh and delicious. Yum. Love the idea can be frozen so can be pre made on another day. This seems a very interesting recipe and one I would like to try out. ooooo this looks so yummy!! I must make, thank you for writing out the recipe!!! That is great that you can freeze it. oh yum, this sounds delish!! Oh I love the addition of the dumplings! !